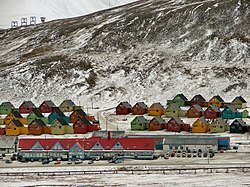 Longyearbyen is the largest settlement and the administrative centre of Svalbard, Norway. As of 2013, the town had a population of 2,043. Because Longyearbyen is quite far north, it has very long daylight hours during the summer, and very short daylight hours in the winter. It has midnight sun between 19 April and 25 August. Longyearbyen has polar night between 27 October and 15 February. It is milder than other places at the same latitude, due to warming from the sea. This means that surprisingly high temperatures can occur. For example, Longyearbyen reached almost into double figures Celsius on 30 January 1984. The warmest recorded temperature was as high as 25 °C (77 °F) on 17 July 1977. The coldest temperature was a very cold −46.3 °C (−51.3 °F) on 4 March 1986. Longyearbyen is badly affected by global warming, due to its Arctic position. On 1 August 2015, a record August temperature of 23.6 °C (74.5 °F) was recorded. ↑ "Spitzbergen (Svalbard) Informationen rund um die arktische Inselgruppe". Spitzbergen - Svalbard. ↑ Planet, Lonely. "Longyearbyen travel - Svalbard, Norway". Lonely Planet. ↑ "Sunrise and sunset times in Longyearbyen, February 2015". www.timeanddate.com. ↑ 4.0 4.1 "HugeDomains.com - VoodooSkies.com is for sale (Voodoo Skies)". www.hugedomains.com. ↑ 5.0 5.1 "Vei 238 Weather - Personal Weather Station: ILONGYEA2 by Wunderground.com - Weather Underground". www.wunderground.com. ↑ "Climate and daylight in Svalbard (Longyearbyen)". NordicVisitor. Retrieved September 24, 2015. ↑ Sjöblom, Anna. "Weather Conditions on Svalbard" (PDF). Retrieved September 24, 2015. ↑ "Sunshine & Daylight Hours in Isfjord Radio, Svalbard, Norway Sunlight, Cloud & Day length". www.svalbard.climatemps.com.